Transition is the period of time when young people are moving from childhood into adulthood. The transition journey is from age 14 to 25 years. Council services for adults are different from those for children, so it is important that young adults get the advice, support and services they need to live a full life. This is a very important stage in a young person's life because they need to make plans for their future care arrangements, which will help them, live as independently as possible. The key legislative frameworks that sets out the transition journey of a younger person (and their parent/carer) includes the Care Act (2014), Children and Families Act (2014) and SEND Code of Practice. Other legal frameworks include the Mental Capacity Act (2005), DOL’s/BIA and Mental Health Act (2007). 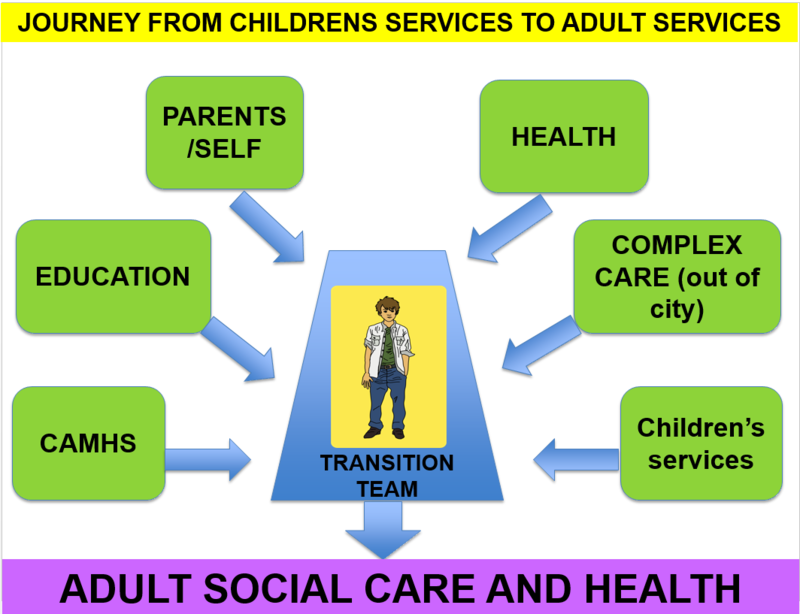 The journey of transition from children to adult services is defined as being from fourteen to twenty-five years of age. The Care Act (2014) places a duty on local authorities to conduct assessments for children, children’s carers and young carers, where there is a likely need for care and support after the young person in question turns 18, and a transition assessment would be of ‘significant benefit’. The legal framework enables an early Care Act assessment be completed (before the age of 18), to facilitate an effective transition from children’s to adult services. In Liverpool, a transition team was set up in 2015 and is made up of 13 assessors, both social workers and social care assessors. There is also a Team Leader. The transition team is centrally located in a citywide hub. Since mid-2016, the transition team has been co-located with the Children’s Disability Team. However, the Team always aim to identify young people, as early as possible, in order to plan for, or prevent the development of, care and support needs. At the optimal time, a supported self-assessment (SSA) is conducted that focusses on the young person’s wellbeing and their aspirations. The process must be person-centred throughout, involving the young person and supporting them to have choice and control. The assessment process attempts to identify the barriers to the young person realising these aspirations, and will then look at how to support the young person to overcome these barriers. This can be done in a variety of ways, from signposting to a universal service to the commissioning of services. Building on the strengths of an individual in conjunction with promoting independence, assessors must take an asset based and ‘Whole family’ approach to completing an assessment and providing an intervention. This means that assessors must identify everyone in the ‘family’, particularly young carers; get the whole picture; make a plan that works for everyone and then checks that it is working for the whole family. Adult and children services are currently working together to review the referral pathways to adult services transition team. This has led to a number of workshops to map out the current pathways and develop the key factors of what is a ‘good pathway’. The workshops adopted a co-design approach, in including multi-agencies, parents/carers and the views of young people. Their needs must be due to a physical or mental impairment or illness - these include sensory, learning or cognitive disabilities or illnesses, brain injuries or an illness arising from substance misuse. Their needs must affect their ability to achieve two or more specified outcomes listed below. Their wellbeing must be, or will likely to be, significantly affected if they do not achieve the specified outcomes listed below. An assessor will look at whether the person’s needs affect their ability to achieve two or more of the following outcomes. They will also look at the level of assistance person needs, if any, to achieve them. Being able to make use of the adult’s home safely. Maintaining a habitable home environment. Developing and maintaining family or other personal relationships. Accessing and engaging in work, training, and education or volunteering. Making use of necessary facilities or services in the local community including public transport and recreational facilities or services. Carrying out any caring responsibilities, the adult has for a child. If the local authority is going to directly commission a service, the assessor completes a Service Specification. This sets out how the service needs to look in order to meet the young person’s needs and outcomes as identified by the Care Act Assessment; how the needs are to be met, how often and by whom. It will specify what training and skills the service needs to employ. The service specification is then shared with appropriate providers and they are then invited to make offers of care and/or accommodation. The young person is then able to choose from a variety of providers. Commissioned Adult Social Care services are not free. Following on from your Self Supported Assessment (SSA), which works out what support you need to meet eligible needs and how much it will cost to provide, we’ll offer to complete a financial assessment to work out how much of that cost we will pay, and how much you’ll need to pay yourself. The amount of income, savings or assets you have, will determine the level of financial contribution towards some or all of your social care and support. What if I cannot manage my own finances? There are independent organisations and services you can go to for financial advice. If we think, you may benefit from independent financial advice. These include charities and independent financial advisors (IFAs). Sometimes you might have to pay a fee for advice.